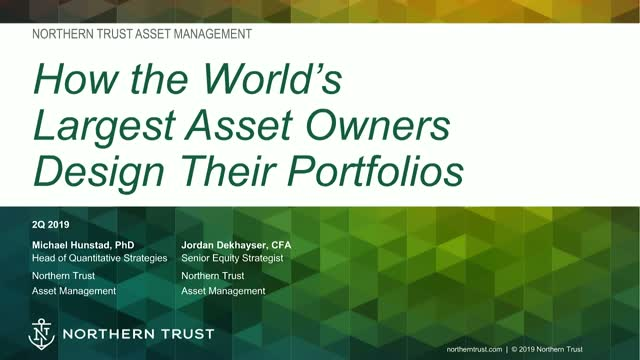 Northern Trust Asset Management’s quantitative research group has performed comprehensive analysis on 300+ institutional portfolios, and they often find the same problem: dilution of material equity exposure is causing portfolios to underperform. In this session, we will take a deep dive into the root cause of common dilution outcomes at the portfolio and strategy level, and what you can do to fix it. Vikas Kapoor, Co-Head of Custom Alternative Solutions at AB, will discuss why he believes that investors can access exposure to alternatives more efficiently, with greater transparency, lower fees, and improved risk budgeting than traditional hedge funds. Institutional investors are increasingly using factors as a lens to analyze asset allocation, but what is the optimal mix of factors when it comes to portfolio construction? In this next installment of our webinar series, we take a more holistic approach to discussing how factors should be viewed in the context of your strategic and tactical asset allocation and fulfillment. This time we’re returning to India, one of the most compelling emerging market equity stories to excite, and intrigue, institutional investors. But is all as it seems? Looking beyond the headlines we interrogate the Indian growth story, providing investors with the fresh and unvarnished analysis they need to know. Sure – we know – the past several years have been pretty tough for emerging market investing but this year’s strong returns reflect a sharp improvement in the earnings outlook and the macroeconomic environment. In fact, strong earnings growth prospects, reasonable valuations and solid investor flows remain very supportive of equity return potential across emerging markets. This time we’re taking a close look at global equities. Everyone wants to find reliable returns despite today’s bouts of geopolitical uncertainty. But there’s more than one way to do that. Investors might consider a core vs. satellite approach. Others might look for a smoother ride. We’ll discuss the global landscape as well as the factors that drive potential over- and underperformance. Then we’ll look at approaches that might meet the challenges investors are facing today. Matthew Peron, Global Head of Equity, and Michael Hunstad, PhD, Director of Quantitative Research. An inside look at the techniques large asset owners are using today to better understand their factor exposures and implement more efficient portfolios. On the heels of the Fed’s 25 basis point rate increase in March, investors are looking for strategies that better navigate a rising rate environment. In this next webcast we’ll review the market backdrop for rates and credit and look to understand which solutions may deliver the best solutions to investors across the fixed income universe. We’re taking a deep dive on India – one true standout in emerging market equity investing and one of the most exciting, if challenging, countries to invest in. If you haven’t already made a specific country allocation to India, you probably should do and we’ll tell you everything you need to know to do so. We’ve explored the most prevalent strategies being used by the world's largest asset owners in Part 1, but now we want to dive into implementation. In this next installment of our webinar series (overview below) we will take a deep dive into how to implement various factor-based strategies based on various objective types. In this installment of our webinar series we take another step beyond theory into the practical “how to” of factor investing. We will take a deep dive into the comprehensive multi-factor programs that were designed to meet specific and complex objectives. Soaring stock prices always thrill investors, but on the flip-side their efforts to not lose money are ultimately what helps build wealth – and capture performance – over time. In this next 45-minute webcast, moderator Duncan Kerr and guest experts will be exploring and examining precisely how defensive positioning in portfolios can and should be investors’ best form of attack.